We spend a lot of time in our vehicles, which makes it a little tough to keep our car’s interior in good shape. None of us want to be driving around in an unclean car, but many of us don’t know how to remove those tough stains from our upholstery. Here are a few tips for keeping your car’s carpet and upholstery in top shape. An easy way to maintain your car is to keep up with the basic care. 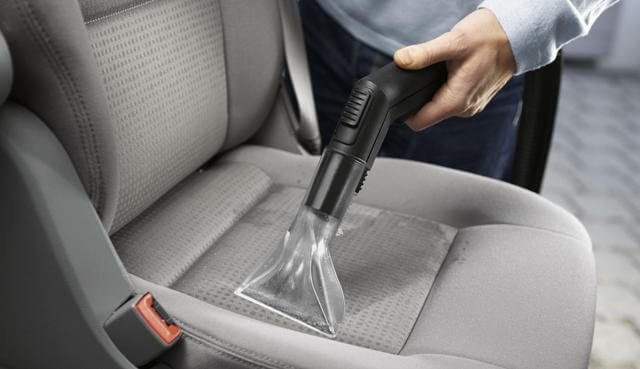 Wash your car regularly, vacuum the interior both mats and seats. If you accidentally spill something, clean it immediately by diluting it with cool water, blot excess with a clean rag or paper towel. Consider deep cleaning your fabric upholstery and carpet every three months or so. Mix a cup of vinegar and some dish soap in a gallon of hot water. Use a hard-bristle brush to work into fibers. Let sit for about 30 minutes before rinsing with water and blotting dry. If you have leather interior you can use a cloth soaked in water and a low-pH soap to clean it. Allow to thoroughly dry. Condition to prevent drying and cracking. Clean vinyl upholstery with a damp rag and baking soda. Rinse with water and dish soap. Avoid using oil- or mineral-based cleaners, which can make vinyl stiff. We also suggest having the interior detailed by a professional every year or so. Stubborn stains: Some fabric or carpet stains that remain even after initial cleaning can be broken up with glass cleaner. First, test an inconspicuous area to be sure it won’t create damage. Then, saturate the area with glass cleaner, let it sit for five minutes, and then blot to clean. Ink: After testing a hidden area for possible damage, coat the stain with hair spray. Allow it to absorb for a few minutes, then wipe off. Repeat as needed. Blood: Make a paste of cold water and powdered laundry detergent. Apply to the stain until dry, then brush or vacuum all excess detergent. Faded carpet: For non-wool carpet, try ammonia. First, vacuum thoroughly. Then, mix half a cup of ammonia and a pint of water and mop into the carpeting. Blot any excess. Carpet or fabric indentation: Cover the mark with a damp towel. Gently iron towel with an iron set on low. To avoid melting fibers, don’t use a hot iron and don’t leave in one spot for too long. We hope you found these tips helpful! Remember, caring for your car should be a priority, you’ve invested money into your vehicle, so take pride in it and keep it looking its best. If you’re looking to ship your car, call us at Auto Transport 123 for a free quote!